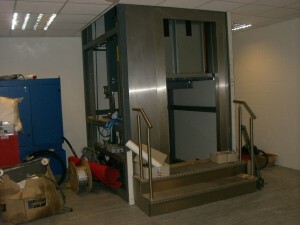 Hydratec, who are based in Yateley, Hampshire are a leading specialist hydraulic lifts services company and wanted to install a demo lift in their mezzanine to assist training their engineers. Hampshire Mezzanine Floors were awarded the task of forming an opening in their existing mezzanine floor to assist their engineers’ in learning how to service and maintain these types of lifts. The challenge for HMF was that the lift was part assembled in two sections so the opening of the floor was made oversize to enable the lift to be brought up through the floor at an angle. This involved removing the existing lights and smoke detectors from the suspended ceiling and re-routing electrical services within the ceiling void. The suspended ceiling was then partly dismantled and the carpets were removed from the first floor office accommodation to allow the mezzanine installation team to remove the joists and decking of the existing mezzanine and insert new supporting steel work. Once this was done, the client then had their lift installed and Hampshire Mezzanine Floors returned and re-fitted the mezzanine floor around the lift. HMF also fitted stud partitioning around the lift enclosure on the first floor and redecorated the local area. 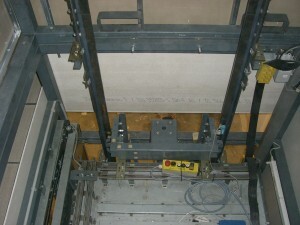 The suspended ceiling was then reinstated to the lift shaft on the ground floor. These works were carried out in a phased operation to suit the clients’ business requirements.